When people ask us how we met, we always smile and usually we look at each other. I’m not sure why it’s just a reaction I guess. We used to be a little nervous about telling people we met in a chat room. Now sites like Match.com make finding a mate online common and acceptable. In the 90's when we met, it was new territory and a little scary. The Romance wasn't first dates and roses, it was poems and fairy tales. Now we tell our story and smile. It’s OUR story and it is just as crazy as we are. I was in Cali, trying to go to school and work while raising two young boys. No matter how hard I seemed to try, there was never enough time in the day or money in the account for anything that even slightly resembled a social life. It didn’t matter really; I didn’t actually want one. I’d been burned a couple times and I just really didn’t have a lot of faith left in love or relationships. I needed to focus on getting myself together and trying to figure out how to keep on top of being a single parent. Romance wasn't an option until I felt like I had my head screwed on tight. I have always been a writer. When the Internet started to gain popularity, I became a fan. I loved being able to research for my stories, see photos of far off places, and actually talk to people around the world without leaving my living room. With the help of my dial-up modem, I was set free. One of the rules however of the internet chat rooms was to be cautious about who you were giving your information to. There are a lot of crazy people out there. So, like everyone else, I logged on and created an online identity. I found a few new friends, and we became ICQ buddies. Someone mentioned that I might really enjoy this website for writers of fantasy fiction. I was introduced to “The Park,” which ended up being a role-playing internet site. I LOVED IT! My not-yet-husband was just getting out of a long-term relationship with a girl who, let's just say wasn't a good fit. He was hurt and wasn’t actually thinking of getting into another relationship either. But like a lot of other geeks, he and his friends were playing D&D in the basements of their parents’ house. He also turned to the internet to play with other people. However he was all the way on the other side of the country in Maryland. Much to far for a quick road trip or even a weekend meet-up. Before websites like The Park, geeks were forced to meet in the school library. Or Steve’s mom’s house with his brother who liked to tell everyone that he liked to sleep naked. And formed little groups after school. Thanks to the Internet, we had an online place for nerds to sit and create wonderful characters and play out scenarios with other people around the world. I loved this gathering time of creative minds. We would come together at common times. We would play out different characters and little by little we became loyal bands of Elves, Fairies, Dragons, Angels, and even a stray Pokémon from time to time. Even though we knew it was fiction, the bonds of friendship still gathered steam. Even online, romance is hard to avoid. But it was safer, and I didn’t have to get emotionally involved. I could still keep my distance and turn it off, right? Weeks turned into months, and before I knew it our small group of writers had been together for a couple of years. People had come and gone; some had actually started meeting up in real life and forged relationships. I remained single, except for my fictional girls online. I loved being able to meet up with friends and “dance” the night away with a handsome knight or go off to fight the bad guys with the rest of the boys. However something started to stir in me, I wanted something more than just pretend. Was it real life romance? Maybe I should accept a few of those phone call requests, after all… what would it hurt? Bravely I gave my number to a friend, a good man who was always making me laugh. He was and still is, one of the sweetest guys I had ever met. He and I became very close, and I found that for the first time in many years I was willing to consider having a relationship again. Even though over and over I had given my heart to someone who had no idea what to do with it. This time I wanted to be sure. As it turns out, that wonderful friend wasn’t the right one either, he was the one who made me smile and learn how to trust again and the one to introduce me to a new group of friends online. My soon to be husband was one of those online friends, he was an Angel in a bar full of monsters, I was one of those monsters. It was there, you know, that “spark” I felt it and even though I wasn’t sure what exactly IT was, I was intrigued by it and wanted more. It wasn’t long before we did something crazy, we both left our homes and moved in together without ever meeting up in real life before our first night in our house together. He left his single life and became an instant father, taking on a role that was just as much improvisation as it was knowledge of wild little boys. I couldn’t help but fall in love. Yes, he could have been a crazy person, and we took a leap of faith and trusted each other. 15 years later, we are still jumping and trusting that we will always fall into safe arms. No, not every day was perfect, and no marriage is. We had to learn to adapt and let go. We are still taking chances and trying new things. He still loves D&D. I am still a writer. He’s an incredible father and husband, and I owe it all to that weird little chat room full of monsters and heroes. 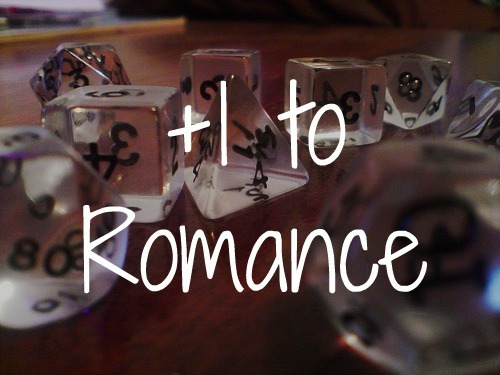 I'm so glad that I rolled the dice in hopes of romance. What's your Love Story? Share it in the comments or send us the link to in your blog!